The Abruzzo, Lazio and Molise National Park is carrying out a "Biodiversity Project" aimed to census all plant and animal species living in the Park area. Dr. Danilo Russo, researcher at the Park research institute, Centro Studi Ecologici Appenninici (CSEA), in collaboration with Dr Gareth Jones (University of Bristol, UK), one of the world's leading expert in the field of bat conservation, is working to obtain an exhaustive list of bat species and to map their distribution. 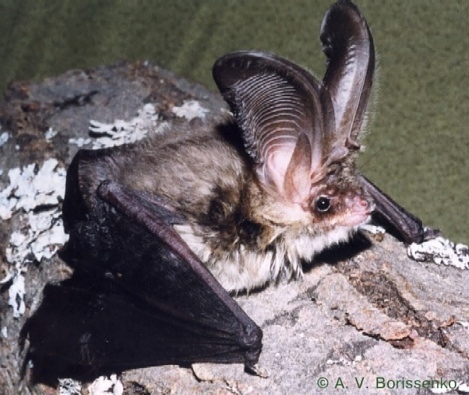 Brown long-eared bat (Plecotus auritus), both typical tree-dwellers. Information on preferred forest sites is vital to protect these species. Foraging and drinking sites will be identified by recording the calls that bats emit in free-flight. Once selected the most favourable sites, the bats will be captured with mist-nets and fitted with radio-tags applied by means of a non-toxic glue. This procedure is completely harmless to bats and has been successfully applied to Barbastelle and long-eared bats. Since the tags weight less than 5% of the bat's body mass, they have no influence on the bat activity and behaviour. Soon after tagging, the bats will be released and tracked to their tree-roosts. The roosting sites will be mapped and protected by the Abruzzo National Park.